I have decided that 2010 is going to be a year where I participate in lot of challenges! It's like an addiction for me now -- I just can't resist them. Who knows how well I will do with all of these, but I think if I don't sign up, I won't even try! The latest one that I just "have" to sign up for is the South Asian Author Challenge hosted by S. Krishna's Books. What is the South Asian Author Challenge? This challenge is to encourage people to read books by South Asian Authors – South Asia being India, Pakistan, Bangladesh, and Sri Lanka. Please not that it does not include the Middle East! The books can be from any time period, contemporary or classic. If you want to talk about the challenge on Twitter or tweet your reviews, use the hashtag #saac. What books qualify for the South Asian Author Challenge? 1) The author must be of South Asian descent. It doesn’t matter if they’re third or fourth generation, or are only half South Asian – I’m pretty flexible on this issue. 2) The book must be about South Asia in some way. It doesn’t have to be set in South Asia, as long as it’s about the culture or history in some way. On the other hand, it can be set in South Asia and not be about South Asians. What are the dates of this challenge? How many books do I have to read for the South Asian Author Challenge? You can sign up at any of these levels, but please specify which level you’re participating at in your sign-up post. Do you have a list of suggested authors or reads for this challenge? Definitely. Here is a list of all the books I’ve read that will qualify for the challenge, and here is a list of South Asian authors (sorted by genre) that you might want to consider. Do I have to make a list of books when I post my sign-up post? No, definitely not. Part of the point of this challenge is to discover new authors through other’s reviews. Being forced to create a list at the beginning would be counterproductive! Do I have to review every book I read for this challenge? No, you don’t. I really hope you’ll choose to review the books you read, but it’s not a requirement! Can I participate even if I don’t have a blog? Are there any prizes for this challenge? YES! There will be a prize for those who sign up before January 1, and another for those who complete it. 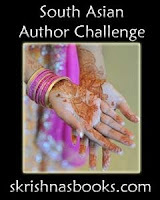 Additionally, I hope to host some South Asian Author Challenge-exclusive giveaways while the contest is going on. Unfortunately, I will be up front about the fact that most of these giveaways will be U.S. only, with some including Canada, because I can’t afford to send books internationally. Can I change challenge levels after January 1? You can’t move down (change from 10 to 7 – that defeats the purpose of it being a challenge!) but you can move up if you find you just love South Asian authors and want to read more of them than you expected! Why are you hosting this challenge? Because there are a lot of great Indian authors out there! While I love Salman Rushdie and Jhumpa Lahiri, some people don’t find their work accessible. I want to show people that Indian authors write every genre – non-fiction, YA, chick lit, historical fiction, as well as literary fiction! Can the books I read be in translation? Absolutely! The point of the challenge is to read South Asian authors – if you’re reading a book you’ve already read, you’re still reading a book by a South Asian author! You’ve convinced me – how do I sign up? I’ll be posting sign-ups later this week (hopefully tomorrow), so keep an eye out for it! Update: Here's the sign up post! I have decided to start small with the 3 book level. I already have a few books that will count towards this challenge sitting on my bookshelves. I am hoping to exceed that 3 book level, but I don't want to take on too much and set myself up for failure! I'm in this one too. I hope I finish it!